This article is about the aquatic plant-like algae. For its use in food, see Edible seaweed; for the similarly-named plant, see Seagrass; for other uses, see Seaweed (disambiguation). Seaweed or macroalgae refers to several species of macroscopic, multicellular, marine algae. The term includes some types of Rhodophyta (red), Phaeophyta (brown), and Chlorophyta (green) macroalgae. Marine algae species such as kelps provide essential nursery habitat for fisheries and other marine species and thus protect food sources; ocean algae species from seaweeds to planktons play a vital role in carbon capture, producing up to 90 percent of the planet's oxygen. Understanding these roles provides guiding principles for conservation and sustainable use of seaweeds to take precedence over industrial exploitation. Mechanical dredging of kelp, for instance, destroys the resource and dependent fisheries. Seaweed are a rich source of multiple biologically active compounds including proteins and polysaccharides with promising uses in nutrition, biomedicine, bioremediation, and other uses. "Seaweed" is a colloquial term and lacks a formal definition. A seaweed may belong to one of several groups of multicellular algae: the red algae, green algae, and brown algae. As these three groups do not have a common multicellular ancestor, the seaweed are in a polyphyletic group. In addition, some tuft-forming bluegreen algae (Cyanobacteria) are sometimes considered to be seaweed. Seaweed's appearance somewhat resembles non-arboreal terrestrial plants. The stipe and blade are collectively known as the frond. Two specific environmental requirements dominate seaweed ecology. These are the presence of seawater (or at least brackish water) and the presence of light sufficient to drive photosynthesis. Another common requirement is a firm attachment point, although some genera such as Sargassum and Gracilaria have species that float freely. As a result, seaweed most commonly inhabit the part of a sea that is close to the shore (the littoral zone) and within that zone more frequently on rocky shores than on sand or shingle. Seaweed occupy a wide range of ecological niches. The highest elevation is only wetted by the tops of sea spray, the lowest is several meters deep. In some areas, littoral seaweed can extend several miles out to sea. The limiting factor in such cases is sunlight availability. The deepest living seaweed are some species of red algae. Others have adapted to live in tidal rock pools. In this habitat, seaweed must withstand rapidly changing temperature and salinity and even occasional drying. At the beginning of 2011, Indonesia produced 3 million tonnes of seaweed and surpassed the Philippines as the world's largest seaweed producer. By 2011, the production was estimated to have reached 10 million tonnes. Seaweed is consumed by coastal people, particularly in East Asia, e.g. Japan, China, Korea, Taiwan, and Southeast Asia, e.g. Brunei, Singapore, Thailand, Burma, Cambodia, Vietnam, Indonesia, Philippines, and Malaysia, and also in South Africa, Belize, Peru, Chile, the Canadian Maritimes, Scandinavia, South West England, Ireland, Wales, California, and Scotland. In Asia, Gim (Korean food) (김, Korea), nori (海苔, Japan), zicai (紫菜, China) are sheets of dried Porphyra used in soups, sushi wrap or onigiri (rice balls). Chondrus crispus (commonly known as 'Irish moss' or carrageenan moss) is another red alga used in producing food additives, along with Kappaphycus and gigartinoid seaweed. Porphyra is a red alga used in Wales to make laverbread. Laverbread, made from the seaweed, and sometimes also with oat flour, is a popular dish there. In northern Belize, edible seaweed are mixed with milk, nutmeg, cinnamon, and vanilla to make a common beverage affectionately called "dulce" (or "sweet"). Seaweed are also harvested or cultivated for the extraction of alginate, agar and carrageenan, gelatinous substances collectively known as hydrocolloids or phycocolloids. Hydrocolloids have attained commercial significance as food additives. The food industry exploits their gelling, water-retention, emulsifying and other physical properties. Agar is used in foods such as confectionery, meat and poultry products, desserts and beverages and moulded foods. Carrageenan is used in salad dressings and sauces, dietetic foods, and as a preservative in meat and fish products, dairy items and baked goods. The development of seaweed as an alternative and sustainable source of food and animal feed ingredients depends on the sustainability of the natural resource of raw biomass and on moving the process of feed development from laboratory to industrial scale. Alginates are commonly used in wound dressings (see alginate dressing), and production of dental moulds. In microbiology research, agar – a plant-based jelly similar to gelatin and made from seaweed – is extensively used as culture medium. Carrageenans, alginates and agaroses (the latter are prepared from agar by purification), with other lesser-known macroalgal polysaccharides, have several important biological activities or applications in biomedicine. Research suggests that the Australian seaweed Delisea pulchra may interfere with bacterial colonization. Sulfated saccharides from both red and green algae have been known to inhibit some DNA and RNA enveloped viruses. Seaweed extract is used in some diet pills. Other seaweed pills exploit the same effect as gastric banding, expanding in the stomach to make the body feel more full. The strong photosynthesis of algae creates a large affinity for nutrients; this allows the seaweed to be used purposely to remove undesired nutrients from water. Nutrients such as ammonia, ammonium nitrate, nitrite, phosphate, iron, copper, as well as CO2 are rapidly consumed by growing seaweed. Reefs and lakes are naturally filtered this way (the seaweed being consumed by fish and invertebrates), and this filtering process is duplicated in artificial seaweed filters such as algae scrubbers. Seaweed (macroalgae), as opposed to phytoplankton (microalgae), is used almost universally for filtration purposes because of the need to be able to easily remove (harvest) the algae from the water, which then removes the nutrients. Microalgae require more processing to separate it from the water than macroalgae does; macroalgae is simply pulled out. When used for filtration, saltwater algae commonly grows species of Cladophora, Ulva (sea lettuce), and Chaetomorpha. Freshwater filtration applications are useful, too, and will commonly grow species such as Spirogyra. Other seaweed may be used as fertilizer, compost for landscaping, or a means of combating beach erosion through burial in beach dunes. Seaweed is under consideration as a potential source of bioethanol. Alginates enjoy many of the same uses as carrageenan and are used in industrial products such as paper coatings, adhesives, dyes, gels, explosives and in processes such as paper sizing, textile printing, hydro-mulching and drilling. Seaweed is an ingredient in toothpaste, cosmetics and paints. 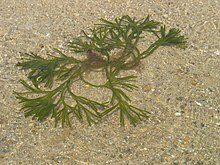 Seaweed is also used for the production of bioyarn (a textile). Seaweed may provide excellent opportunities for their industrial exploitation if sustainable without destroying habitat, as they could be a source of multiple compounds (i.e. polysaccharides, proteins and phenols) with applications such as food  and animal feed, pharmaceuticals  or fertilizers. Seaweed collecting is the process of collecting, drying and pressing seaweed. It was a popular pastime in the Victorian era and remains a hobby today. In some emerging countries, Seaweed is harvested daily to support communities. Women in Tanzania grow "Mwani" (seaweed in Swahili). The farms are made up of little sticks in neat rows in the warm, shallow water. Once they harvest the seaweed, it is used for many purpose: food, cosmetics, fabric, etc. Seaweeds are also used as animal feeds. They have long been grazed by sheep, horses and cattle in Northern Europe. They are currently particularly valuable for fish production. Adding seaweed to livestock feed can substantially reduce methane emissions from cattle. Rotting seaweed is a potent source of hydrogen sulfide, a highly toxic gas, and has been implicated in some incidents of apparent hydrogen-sulphide poisoning. It can cause vomiting and diarrhea. The stinging seaweed Microcoleus lyngbyaceus contains several known toxins including lyngbyatoxin-a and debromoaplysiatoxin. Direct skin contact can cause seaweed dermatitis characterized by painful, burning lesions that subsist for several days. The following table lists a very few example genera of seaweed. Brown In intertidal zones on rocky shores. Brown Also known as kelp, 8–30 m under water, cultivated for food. Brown Giant kelp, forming floating canopies. Red Intertidal zones in temperate climate. Cultivated for food. ^ Hayes, Maria; Mora, Leticia; Garcia-Vaquero, Marco (April 2019). "In Vitro and In Silico Approaches to Generating and Identifying Angiotensin-Converting Enzyme I Inhibitory Peptides from Green Macroalga Ulva lactuca". Marine Drugs. 17 (4): 204. doi:10.3390/md17040204. ^ O’Doherty, John; Sweeney, Torres; Tiwari, Brijesh; Rajauria, Gaurav; Garcia-Vaquero, Marco (August 2018). "Extraction and Yield Optimisation of Fucose, Glucans and Associated Antioxidant Activities from Laminaria digitata by Applying Response Surface Methodology to High Intensity Ultrasound-Assisted Extraction". Marine Drugs. 16 (8): 257. doi:10.3390/md16080257. ^ Lewis, J.R. 1964. The Ecology of Rocky Shores. The English Universities Press Ltd.
^ a b "Seaweed farmers get better prices if united". Sun.Star. 2008-06-19. Retrieved 2008-07-16. ^ "Springtime's foraging treats". The Guardian. London. 2007-01-06. Retrieved 2008-07-16. ^ "RI aims to become world's largest seaweed producer". Waspada.co.id. 2011-04-16. Retrieved 2012-06-28. ^ "Devon Family Friendly - Tasty Seaweed Recipe - Honest!". BBC. 2005-05-25. Retrieved 2012-06-28. ^ Round F.E. 1962 The Biology of the Algae. Edward Arnold Ltd.
^ a b c Garcia-Vaquero, M.; Hayes, M. (2016). "Red and green macroalgae for fish and animal feed and human functional food development". Food Reviews International. 32: 15–45. doi:10.1080/87559129.2015.1041184. ^ Francesca Cappitelli & Claudia Sorlini (2008). "Microorganisms attack synthetic polymers in items representing our cultural heritage". Applied and Environmental Microbiology. 74 (3): 564–569. doi:10.1128/AEM.01768-07. PMC 2227722. PMID 18065627. ^ a b Kazłowski B; Chiu YH; Kazłowska K; Pan CL; Wu CJ (August 2012). "Prevention of Japanese encephalitis virus infections by low-degree-polymerisation sulfated saccharides from Gracilaria sp. and Monostroma nitidum". Food Chem. 133 (3): 866–74. doi:10.1016/j.foodchem.2012.01.106. ^ "New Seaweed Pill Works Like Gastric Banding". Fox News. ^ Elena Gorgan (6 January 2009). "Appesat, the Seaweed Diet Pill that Expands in the Stomach". softpedia. ^ Rodriguez, Ihosvani (April 11, 2012). "Seaweed invading South Florida beaches in large numbers". South Florida Sun-Sentinel. Retrieved 2012-04-11. ^ "Seaweed Power: Ireland Taps New Energy Source". alotofyada.blogspot.co.uk. 2008-06-24. Retrieved 9 April 2018. ^ Chen, Huihui; Zhou, Dong; Luo, Gang; Zhang, Shicheng; Chen, Jianmin (2015). "Macroalgae for biofuels production: Progress and perspectives". Renewable and Sustainable Energy Reviews. 47: 427–437. doi:10.1016/j.rser.2015.03.086. ^ Garcia-Vaquero, M; Rajauria, G; O'Doherty, JV; Sweeney, T (2017). "Polysaccharides from macroalgae: Recent advances, innovative technologies and challenges in extraction and purification". Food Research International. 99 (Pt 3): 1011–1020. doi:10.1016/j.foodres.2016.11.016. hdl:10197/8191. PMID 28865611. ^ "Seaweed Thatch". naturalhomes.org. Retrieved 9 April 2018. ^ "Seaweed shown to reduce 99% methane from cattle". irishtimes.com. Retrieved 9 April 2018. ^ https://www.cabdirect.org/cabdirect/abstract/19822902103 "Escharotic stomatitis caused by the "stinging seaweed" Microcoleus lyngbyaceus (formerly Lyngbya majuscula): case report and literature review"
^ https://onlinelibrary.wiley.com/doi/full/10.1111/j.1365-4632.2011.05042.x "Lyngbya dermatitis (toxic seaweed dermatitis)"
Wikimedia Commons has media related to Marine algae. SeaweedAfrica, information on seaweed utilisation for the African continent. Seaweed. A chemical industry in Brittany, in the past and today. AlgaeBase, a searchable taxonomic, image, and utilization database of freshwater, marine and terrestrial algae, including seaweed.